Part of the same group who run Shrub & Shutter’s in Brixton, First Aid Box now serves food and very good food indeed. 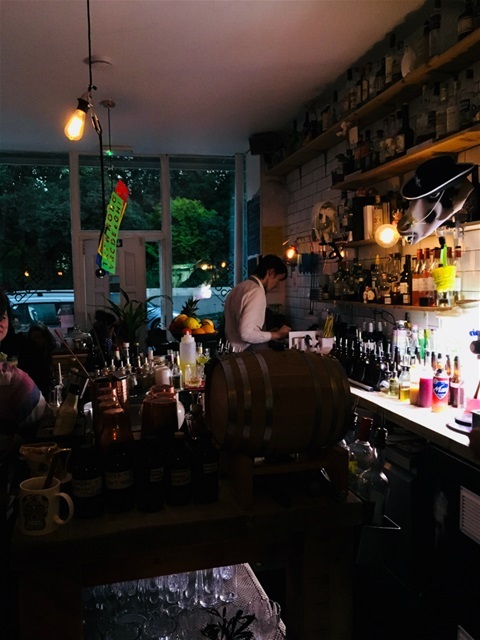 Situated in the lovely little Herne Hill Village, right next door to Bustling Brixton F.A.B really is fab and is certainly up there with all that Brixton has to offer. And now, finally, they do food too, really beautifully presented and equally tasting food, the gravlax, ceviche, and carpaccio were all sublime, the breaded chicken was succulent & moist and the fresh hake with risotto all went down a treat. With its cosy front seating area just made for sipping on cool medicinal inspired cocktails to its extended barn feeling seating area out back where you can both eat and drink, you will settle in easily, it may be on the small side small but it also perfectly formed.